True Economics is about original economic ideas and analysis concerning everyday events, news, policy views and their impact on the markets and you. Enjoy and engage! The speech focuses on what went wrong in Cyprus. In the speech, Mr Rehn commits gross omissions and conjures gross over-exaggerations. Nowhere in his speech does Mr Rehn acknowledge that Cypriot banks were made insolvent overnight by the EU (including EU Commission, where Mr Rehn is in charge of Economic and Monetary affairs) mishandling of PSI in Greek government bonds. Nowhere in his speech does Mr Rehn acknowledge that Cypriot banks were massively over-invested in 'core tier 1 capital' in the form of zero risk-weighted sovereign bonds (Greek bonds) on the basis of direct EU and Basel regulations that treated this junk as risk-free assets. Mr Rehn states that "The banking problems were aggravated by poor practices of risk management. 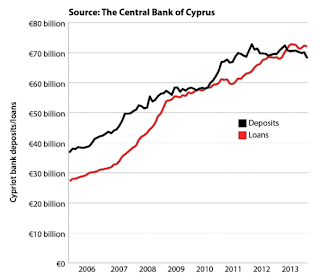 Lacking adequate oversight, the largest Cypriot banks built up excessive risk exposures." But Cypriot banks largest risk mispricing took place on their Greek Government bond holdings and this was (a) blessed by the EU regulators and (b) made more egregious in terms of risks involved by the EU madness of Greek PSI. Mr Rehn claims that "The problems of Cyprus built up over many years. At their origin was an oversized banking sector that thrived on attracting foreign deposits with very favourable conditions." Nowhere is Mr Rehn making a statement that the size of Cypriot banking sector was never an issue with the EU, neither at the point of Cyprus admission into the euro, nor at the accession to the EU, nor in any prudential reviews of Cypriot financial system. Mr Rehn flat out fails to relate his statement on deposits to the fact that the EU is currently pushing banks to hold higher deposits / loans ratios, not lower, and that higher deposits / loans ratio is normally seen to be a sign of banking system stability. 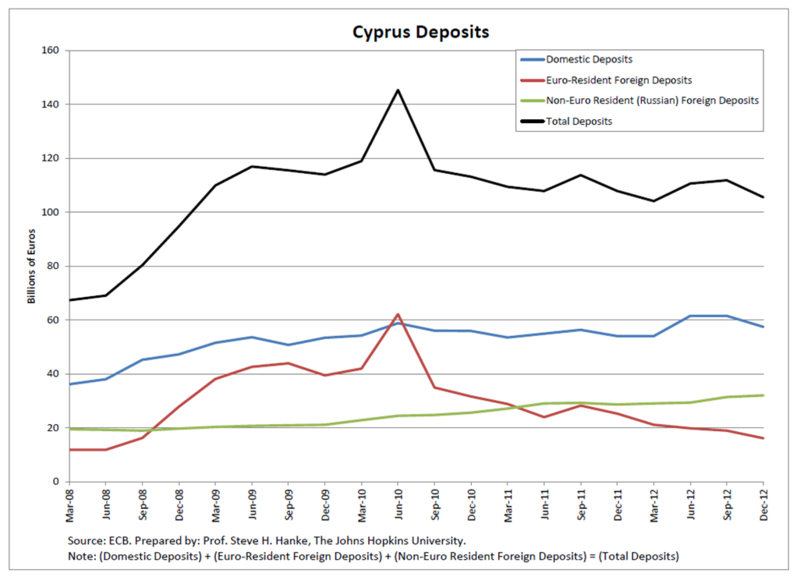 Mr Rehn is also plain wrong on his claims about the nature of deposits in Cyprus. 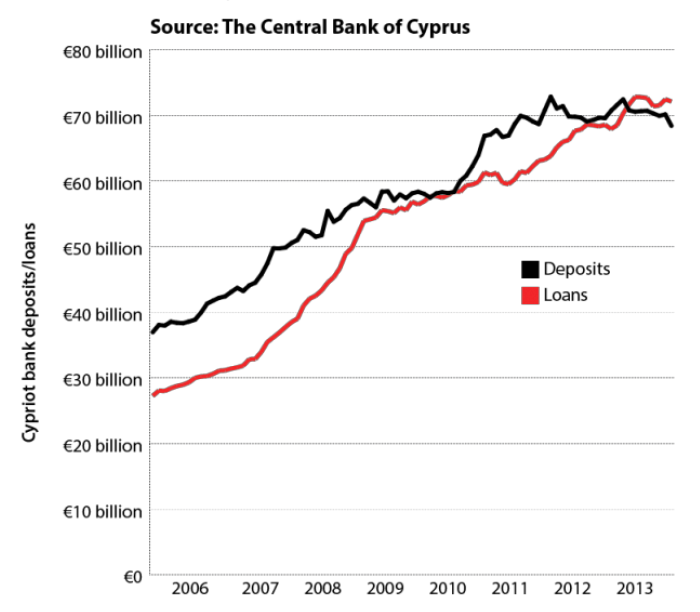 Chart below shows that Cypriot banks' deposits more than doubled in Q1 2008-Q1 2010 on foot of the EU-created mess in Greece and the rest of the periphery. Olli Rehn could not be bothered to read IMF assessment of Cypriot economy from November 2011 (Article IV report) - despite him citing EU Commission June 2011 'warnings' - where IMF clearly states that the core problems faced by Cypriot banking system stem from Greece (page 14) and local commercial banks' loans, not depositors or foreign depositors. 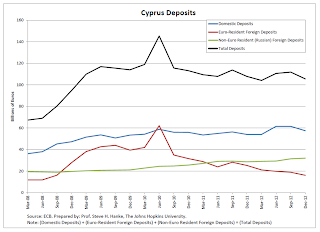 On deposits, IMF states (page 17 paragraph 21) "non-resident deposits (NRD) in Cypriot banks (excluding deposits raised abroad by foreign affiliates) are €23 billion (125 percent of GDP), most of which are short-term at low interest rates." Thus, IMF directly, explicitly and incontrovertibly contradicts Mr Rehn's statement about foreign deposits having been extended on "very favourable conditions". 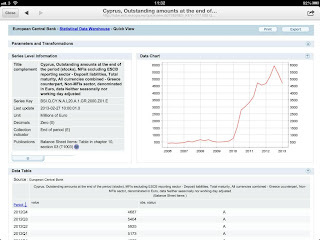 This outflow knocked out billions out of deposits cushion that Cypriot banks needed to reduce their financing needs. And Mr Rhen - the architect in charge of this disaster - has nothing to say about it. I can go on and on. Virtually every paragraph of Mr Rehn's statement is open to critical examination. That is hardly news - Mr Rehn has made so many gaffes and outright bizarre statements in the past (including his assertions at every pre-bailout junction that each peripheral country heading into bailout was fully solvent, fiscally sustainable, etc), he became not just a laughing stock of the markets, but a contrarian indicator for reality. What is of concern is that Mr Rehn is still being given the task of speaking for the Commission on Monetary and Fiscal affairs. Olli Rehn should read something more cogent than his own speeches on what has happened in Cyprus (e.g. business.financialpost.com/2013/03/28/seeds-of-cyprus-disaster-planted-months-ago-by-eu/ and www.reuters.com/article/2013/04/02/us-eurozone-cyprus-laiki-insight-idUSBRE9310GQ20130402 or http://online.wsj.com/article/SB10001424127887323501004578386762342123182.html) and preferably do so free of charge to European taxpayers, on his own time, while up-skilling for his next job. This blog represents my personal views and is not reflective of the views or opinions held by any company, contractor, client or employer I work for currently or have worked for in the past. These views are not an endorsement to take any action in the markets or of any political position, figures or parties. My view on the future of economic development is outlined briefly in the TEDx talk I gave on Human Capital and the Age of Change. 26/5/2013: 'North' out, 'South' in? 12/5/2013: What Greek OSI will mean for IMF?